Frequently operational constraints and the required downtime make it impossible to install new switchgear. Matching lineup projects are your best means to add feeders to an obsolete substation; and are much faster than replacing the entire substation. 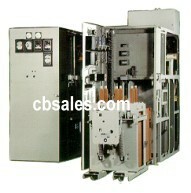 Keep us in mind for adding circuit breakers to your old switchgear. We can add the same as the current equipment or we can upgrade to new vacuum technology. Matching lineups are applicable to 600 - 38,000 volts and can incorporate new protective relays.